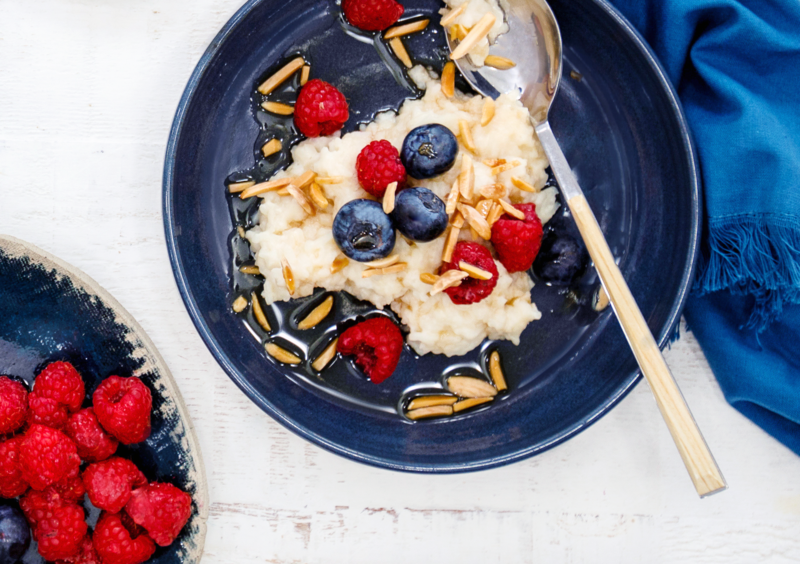 This 5-ingredient rice pudding is so quick and tasty – whether it’s for breakfast or as pudding! To help you give you sustained energy (and because it tastes great), I’ve used SunRice Low GI white rice. (Note: I’ve also made this recipe with SunRice Supergrains before and it also worked so well)! I simply make some extra rice when cooking dinner and use the leftover rice for this recipe. I find it's great for breakfast, as a snack or dessert. SunRice Naturally Low GI White Rice is a variety of long grain rice, called Doongara, which is exclusively grown in Australia. It’s naturally low GI food to provide sustained energy release. Hooray! You can also buy SunRice Low GI brown rice. Also, I don’t think a lot of people realise that rice is naturally gluten-free, which is great news if you’re sensitive or intolerant. This recipe also works really well with dairy, oat or coconut milk. Simply use the milk that you love best. Sub out the maple syrup for honey if you prefer (and don’t need the recipe to be vegan). Feel free to add vanilla essence or cinnamon if you like! Refrigerate overnight in an airtight container or separate single serve jars for ease. Ready in just 10 minutes, I love this super simple, 5-ingredient Low GI Breakfast (or dessert!) pudding. Add rice, almond milk, water, seeds/nuts, and maple syrup to a saucepan. Cook on low-medium heat, stirring often for 8 minutes or until desired thickness. Serve with your choice of toppings such as berries, fruit or toasted nuts/seeds. Disclaimer: I love SunRice and their products. That is why I partnered with them as their Health and Wellness Ambassador. I only work with companies that share my back to basics approach to nutrition. Thanks to SunRice for giving me the chance to create this recipe.